Marijuana laws around the country are evolving at a rapid pace, but growing marijuana in Maryland is still illegal, and defendants who are charged with growing marijuana face possible felony charges. Despite promises by politicians and pro marijuana lobbyist groups, the federal government has not weakened its stance on the legality of marijuana. Regardless, many states throughout the country have legalized the production of marijuana for legitimate medical use. Legal medical marijuana growing is a highly profitable business, which generates millions of tax revenue for states such as Colorado and California. Maryland has recently joined the 20 plus states that sanctions marijuana production, but law enforcement officers are continuing to make hundreds of drug busts each year for illegally growing marijuana. If you or someone you know has been arrested or is being investigated for growing marijuana consult a marijuana lawyer in Maryland immediately. Defendants who do not take action in their marijuana cases can face a permanent criminal record, heavy fines, and even jail time. Growing marijuana without a medical card is not a legal and anyone arrested for growing will most likely be charged with manufacturing marijuana or possession of marijuana with the intent to distribute. Unfortunately for citizens who legitimately grow marijuana for their personal use, police and prosecuting lawyers will almost certainly charge a marijuana grower with felony manufacturing regardless of how many plants he or she is alleged to have possessed. Drug manufacturing is defined as producing, preparing, or compounding any controlled substance. Manufacturing includes naturally extracting a substance such as marijuana or chemically engineering a substance such as cocaine or MDMA. Although the drug manufacturing law does not mention growing, Maryland case law specifically holds that growing marijuana can be considered manufacturing marijuana. On the other hand, if you have been arrested for growing marijuana, an experienced drug lawyer may be able to prevent this charge from being filed, and will fight to have marijuana manufacturing charges dropped in the event that this charge is filed. A person can be arrested and charged with growing marijuana for operating an indoor grow house, or for growing the plant outside in open air. Outdoor marijuana plants are typically harvested during the fall, and there is often an increase in police helicopter surveillance activity in September and October as a result. The state police, DEA, and other Maryland law enforcement offices often conduct flyover surveillance in the more rural areas of Maryland, such as northern Baltimore County, and Prince George’s County. This type of police activity is legal, and supported by case law as long as the helicopter does not hover at a level that would be too intrusive. If police observe marijuana plants in a person’s backyard or garden they may use these observations to initiate an investigation that could ultimately lead to a search warrant and possible arrests. 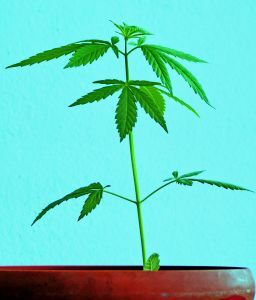 Indoor marijuana growing operations can occur at highly sophisticated grow houses, or could include as little as one plant growing a person’s closet. Either way, if police were somehow to gain entry into a person’s home and observe marijuana plants growing an arrest for drug manufacturing will likely be the result. A Maryland marijuana lawyer may be able to have the evidence in a drug manufacturing case suppressed, and possibly have charges dismissed. Contact The Herbst Firm today if you have been involved in a marijuana growing case.